Alex Ferguson once said: "The game is all about confidence, like most other things in life. Without self-belief you won't achieve anything." If Manchester United are not full to the brim with confidence as they travel to Arsenal today it is hard to imagine when they ever will be. The only blot on Ole Gunnar Solskjaer's copybook since taking over from José Mourinho was the initial Champions League defeat by Paris Saint-Germain, and with that setback having been overcome against all expectation there is a case for arguing that United can still regard themselves undefeated under their new manager. If that is a tad too generous, what is unarguably true is that Solskjaer is out on his own with nine straight away wins and a nice line in can-do optimism. Not even Ferguson's mind games ever worked that well, and the debate over the permanent position has moved on from whether United ought to offer the job to the Norwegian to how they can possibly resist such an astonishingly successful audition. Jaw-dropping results are not the only consideration in Solskjaer's favour, either. Romelu Lukaku has scored six goals in his last three games, the first United player to manage a brace on three successive occasions since Cristiano Ronaldo 13 years ago. That's a striker who was struggling for goals under Mourinho and admitted his game lacked the necessary intensity. There are no complaints on either score now. Lukaku's goals earned United their victories against Crystal Palace, Southampton and PSG, and in the last case especially they were goals that the former, more sluggish Lukaku would not necessarily have scored. For while it is fair to point out that both goals at the Parc des Princes came from defensive mistakes, on both occasions the opportunities were snapped up by a predatory striker with speed of thought and movement. Lukaku was on to Thilo Kehrer's loose pass in an instant, reacting far more quickly than Dani Alves and realising exactly what he had to do. He possibly took the ball slightly wider than he intended in rounding Gianluigi Buffon, though doubtless to the surprise of any Everton fans who remember a certain clumsiness in tight situations, he finished from a narrow angle with aplomb. The partnership with Marcus Rashford that Mourinho seemed to mistrust is alive and working, for it was Rashford who harried Kehrer into the original mistake, and it was Rashford's shot that was spilled by Buffon for the second. It did not look the most venomous of strikes but Lukaku played the percentages and won, his diligent following-up putting him in exactly the right place to take advantage of the goalkeeper's error before any defender could reach the ball. Anticipation and appetite for work have not always been prominent features of Lukaku's game but last weekend Ralf Hasenhüttl, the Southampton manager, said he was an unbelievably difficult player for defences to contain and in midweek in Paris it was easier to see why. Lukaku has had his critics over the years but when he adds alertness and precision to his more obvious qualities of strength and persistence, his confidence increases along with his goal tally. Arsenal defenders should consider themselves warned. 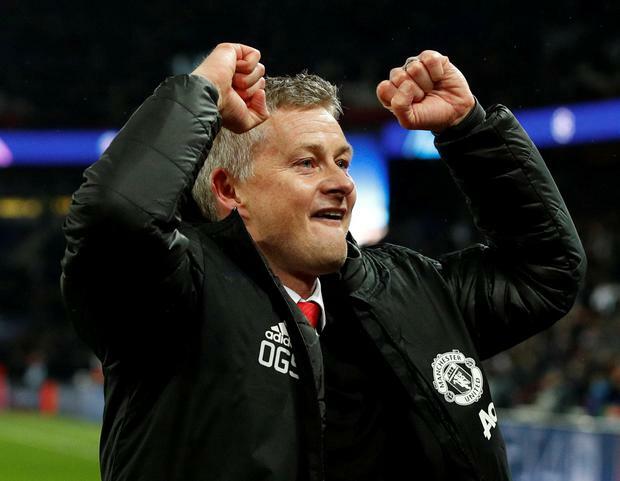 Solskjaer has projected confidence ever since he walked back into Old Trafford and what happened in the first half in Paris showed it is not just an act. If it was a bold move to start Eric Bailly at right-back, it was an even bolder one to accept it was not working and replace him before half-time. Had Solskjaer not made that change, Diogo Dalot may not even have been on the field to fire in the shot that led to the decisive penalty and, though it would be going too far to put the game's dramatic conclusion down to foresight on the part of the caretaker on the sidelines, late attacking substitutions were what allowed United to go forward. Suffice to say that when decisions needed to be made, Solskjaer made them, and that the swagger and sense of purpose that seem to have returned to the United team can probably be traced back to the confident presence in the technical area. It is hard to believe that only a little over three months ago Mourinho was scowling at Rashford for missing a chance and Marouane Fellaini had to rescue United against Young Boys of Switzerland. The script of United's season reads like schoolboy fiction, except some of the latest exploits might be deemed too outlandish and improbable for the target audience. Only one thing is clear as we eagerly await the next instalment. Solskjaer has achieved in less than half a season what some managers spend their entire careers striving for and most never achieve at all: the sense of being irreplaceable. Obviously the title of caretaker ought to mean Solskjaer is highly replaceable, disposable even, but that is the perception he has managed to change. There is not going to be anything convenient or clean about any break at the end of the season, because this supposedly short-term solution has already turned into a tough act to follow.